It’s clear that millions of Australians, especially those in regional areas, are getting a raw deal from the telecommunications market structure in this country. A new independent report has put a price on exactly how much more Telstra’s customers are paying for their fixed broadband and mobile telecommunication services — $3.2 billion per year; the equivalent of paying 14 cents per litre extra at the petrol pump. The Telstra Price Premium report published by The Centre for International Economics (CIE) and commissioned by Vodafone* has revealed that Telstra’s customers are slugged with a price premium of $1.4 billion for mobile phone services and $1.8 billion for fixed services each year above the average price charged for the same services by other carriers. But it’s Telstra’s mobile customers in regional Australia that are being hurt the most. They pay $10 per month for pre-paid services and more than $4 a month for post-paid service, which is more than twice the amount paid by a customer who lives in Sydney. Telstra is the sole network provider in parts of Australia, especially in remote and rural areas, and effectively shielded from competition. For regional customers receiving only Telstra services, the price premium could be between $270 and $450 per household, depending on how many services they use. Figures like the ones exposed by the report reveal the true extent of how much more many Australians are being unfairly charged for their network services, particularly people in regional areas who are forced to pay the premium because Telstra is their only choice of provider. Vodafone is advocating for a fairer playing field, one in which Australian telecommunications consumers, particularly those in regional areas, are the ultimate winners. Greater sharing of regional telecommunications infrastructure reduces costs and promotes competition. Through domestic roaming, the cost of building and upgrading mobile networks would be shared between two or more mobile providers, bringing coverage to more Australians. It also means that consumers receive the benefits of choice because multiple mobile providers can compete on the basis of one mobile network infrastructure in many regional and remote areas. More efficient infrastructure sharing, which will deliver better value for the Australian taxpayers’ dollar and genuine competition for regional mobile subsidies in the future. 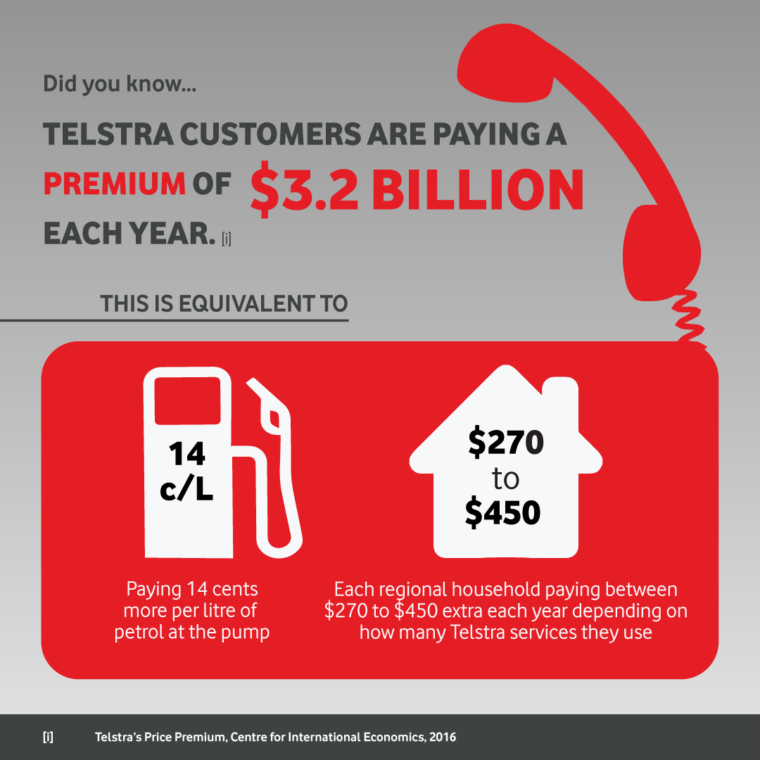 *The Telstra Price Premium report published by The Centre for International Economics (CIE) was commissioned by Vodafone. We wanted an independent assessment of the level of effective competition in both the fixed and mobile markets, and the economic impact it has on consumers.